Waukegan IL – Judges at the Printing Industries of America’s 68th Annual Premier Print Awards have chosen LCP as the recipient of a prestigious “Benny” award. These awards are presented to those who demonstrate a unique ability to create visual masterpieces. Chosen from thousands of entries, each “Benny" represents a unique partnership between designer and printer, need and creativity, technology and craft. This outstanding achievement is a testimony to the caliber of work produced by LCP in Best of Category, Booklet or Brochure series for “LaCourne LIFE*STYLE”. 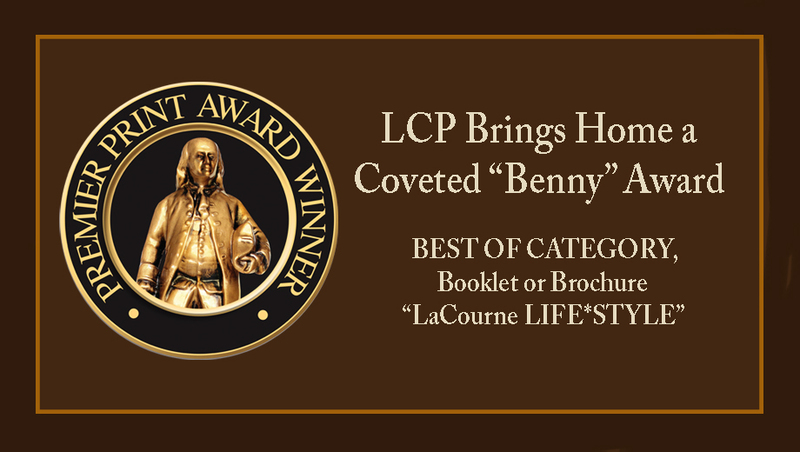 The bronze “Benny” statuette and certificate will be presented to LCP on Sunday, September 10th in Chicago at the Premier Print Awards Gala. The winning entry will be on display in the gallery of the Printing Industries of America booth at PRINT 17, McCormick Place from September 10th through September 14th, 2017. For 47 years, LCP has built a reputation as a premier print solutions provider offering services including: conventional lithography, digital printing, web development, mailing/fulfillment capabilities and grand format printing. LCP, Inc. is located at 98 Noll Street in Waukegan, Illinois. For more information on services visit the website at www.lakecountypress.com or call 847.336.4333.